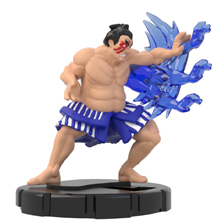 WizKids has released images of some of the 27 Street Fighter figures that will hit retail on August 10th with the debut of the Capcom Street Fighter HeroClix Game (see “HeroClix Street Fighter Game”). The new HeroClix figures are based on Capcom’s popular Street Fighter video game, which debuted in 1987 and pitted competitive fighters from around the world, each with his or her own distinctive fighting style, against each other in action-packed video game melees. Akuma (Japanese for “Devil”) was introduced in Super Street Fighter II Turbo as a secret character and hidden boss. Known for his maroon hair and prayer beads, Akuma is the younger brother of Gouken, and Ryu. E. Honda was introduced as part of the starting lineup in Street Fighter II. He wears his hair in the traditional “chonmage” favored by samurai and modern sumo wrestlers, while he paints his face in the traditional kabuki style of kumdori. Edmundo Honda’s signature move is the “Hundred Hand Slap,” which is highlighted by distinctive clear sculpt. Ken, along with Ryu, has appeared in all the Street Fighter games. He is three-quarters Japanese, but he “represents” the U.S. in the worldwide Street Fighter combats. Typically Ken, who has shoulder-length blonde hair and black eyebrows, wears brown gloves and a black belt as he delivers his famous punch.